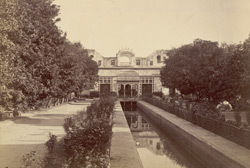 Photograph of the garden of the visitors’ residence at Patiala in Punjab, taken by an unknown photographer in 1898. Patiala is the capital town of Patiala State in the eastern plains of the Punjab, the largest of three states collectively known as the Phulkian States, the others being Jind and Nabha, since the dynasties which held power in these kingdoms were believed to have had a common ancestor, Chaudhary Phul. The town of Patiala was picturesque, and contained an old palace situated in the centre. Newer residences of the Maharaja (Rajendra Singh, ruled 1876-1900) and his officials were located in the environs of the town and were laid out among gardens and shady roads. The visitors' residence was probably one of these buildings. This is a view looking along the formal garden and a water channel towards the residence. The image is one of several prints recording the visit of Lord Elgin to Nabha and Patiala, in an album mainly devoted to his Burma tour of November to December 1898. Victor Alexander Bruce (1849-1917), ninth Earl of Elgin and 13th Earl of Kincardine, served as Viceroy of India between 1894 and 1899.